Residents were displaced Saturday, Dec. 31, after a structure fire in Round Hill. ROUND HILL, Nev. — Fundraising is underway for a Lake Tahoe family displaced by a house fire on New Year’s Eve. 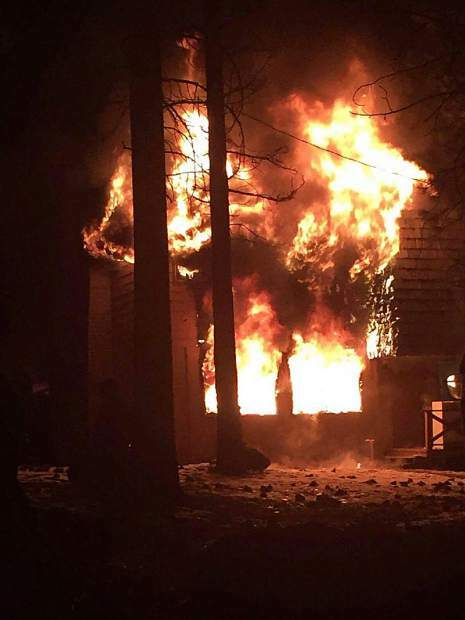 A gofundme page was established less than a day after a single-structure fire ravaged the home in Round Hill, located near Zephyr Cove on Tahoe’s southeast shore. Three family pets died in the fire, the Tahoe Douglas Fire Protection District reported early Sunday morning. The gofundme post identified the residents as Joanna Janowicz, also known as Asia and a long-time general manager at Casey’s in Round Hill, and her 5-year-old son Kian. Janowicz’s boyfriend, Joe, also lived at the home, according to the post, which was created by Amber Jones Madsen. The family was out at dinner when the fire started. As of 9 a.m. Monday, the page had raised nearly $1,000 out of a $100,000 goal. The Red Cross was assisting the family, according to the Tahoe Douglas Fire Protection District. Firefighters found a heavily involved structure fire when they responded around 8 p.m. Saturday. Crews were able to contain the fire and knock it down within 20 minutes. The cause of the fire remains unknown as the investigation is still in progress, the district noted early Sunday morning.